The Muppets scribe Nick Stoller has had quite the varied career. Stoller wrote the screenplays for TV’s Undeclared, Gulliver’s Travels, and wrote and directed Get Him to the Greek, Forgetting Sarah Marshall and the upcoming Five Year Engagement that stars his partner in creative crime, Jason Segel. 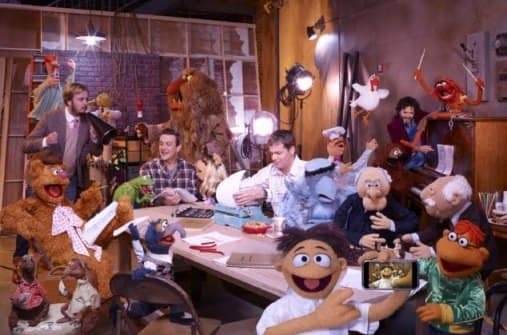 Segel and Stoller have combined forces to bring back The Muppets for a whole new generation and the writer-director visits with Movie Fanatic to exclusively take us inside the creative process of a comic mastermind. Segel and Stoller have crafted a story (check out our The Muppets review) that feels modern, while still staying true to what makes The Muppets magical. Movie Fanatic: Now that The Muppets are about to be re-released into the world, how are you feeling about it all? Nick Stoller: I’m really excited to get it out there. I’ve worked on it for four years. I worked on it for college [laughs]. It’s been many years. It’s been a college length of time to work on a script so I’m just excited to get it out there. I think James Bobin (director) just did such an awesome job. Movie Fanatic: When you sat down to write this and do a new Muppet movie, how did the idea of a new Muppet, Walter, enter the script-writing process? Nick Stoller: Basically at the beginning Jason (Segel) had a meeting at Disney and they asked him if he was interested in any properties of theirs and he said, “What are you doing with the Muppets?” And they said, “We don’t know.” He said, “I’d like to do the Muppet movie.” Then he called me on the drive back from Disney and said, “Do you want to write a Muppet movie?” And I said, “Of course. Do you even have to ask?” On that phone call, which was probably 20 minutes or a half hour, we beat out the entire movie. There’s a lot of stuff that’s changed since then but the big things, including the existence of Walter, were in that first phone call. Movie Fanatic: What did you envision for Walter? Nick Stoller: We knew that we needed a stand-in for us. We needed a super fan. Part of the Muppets breaking up is they’ve kind of lost their enthusiasm a little bit and we needed this super enthusiastic super fan who just loves the Muppets and wants them to get back together. We needed that figure in the movie. And also we needed an entry point for kids who might not know who the Muppets are. So we created this character and made him hyper-enthusiastic in that when he meets Kermit he faints, all that stuff. We even had an early draft where when he gets nervous he yells “Peanut” which was a strange thing [laughs]. Even though that didn’t make the movie that kind of summed him up as a character. His character was kind of the same from the beginning. His origin story changed and went through different iterations, but his personality was the same. Movie Fanatic: Was it a challenge to combine paying homage to the classic Muppets and bringing them into the current times, all in a 90 to 100 minute movie? Nick Stoller: We wanted it to be an homage but we didn’t want to get bogged down by nostalgia. Over four years we did I don’t know how many drafts of the script -- there was a lot of rewriting. Then when James came aboard, he also is a great comedy writer -- he added his own stuff to the script as well. So there was a lot of rewriting. But the nostalgia thing, I actually think we shot a lot of speeches and nostalgia and very earnest stuff. In the very long cut, it became clear that you needed just a little bit of it to make it work. The decision to have them all bond at the end with Rainbow Connection, it was nice to harken back to the nostalgia. James had an awesome idea of recreating the scene from the first Muppet movie on stage. But then we do end the movie with a new song. I think there were versions of the script where we ended with Rainbow Connection but that felt like it could just be a nostalgia thing. So to end with a new song brings it into the now. Movie Fanatic: What’s it like working with Jason Segel and how well do you work together? Nick Stoller: I just feel so lucky that I met him. We just click, in terms of our comedy stuff. I think we both were inspired by the same comedy growing up -- Muppets, Monty Python, Saturday Night Live, and all that. But that we really like to come at it from a character place, a place where there are no villains, except for maybe Tex Richman (Chris Cooper in The Muppets), in a place where things are slightly emotionally complicated but still entertaining. It’s hard to put into words but when we sit and beat out movies, whether it be Sarah Marshall or Muppets or Five-Year Engagement, which is what I’m in the midst of cutting, it’s hard to put into words, but we just click with each other. We both find guys crying really funny. There’s something about that that’s really funny [laughs]. Nick Stoller: Whatever thing he brings on screen is I feel like this movie character star version of who I am a little bit. That pre-existed our collaboration. I didn’t work with him on Freaks and Geeks but I watched him on Freaks and Geeks, pining after Linda Cardellini’s character and I was like, “That was me in high school.” I feel like that’s true of a lot of director-star collaborations, there’s something about whatever that star is bringing to the screen that it’s like who you are in real life put on the movie screen. Movie Fanatic: Obviously you’re a huge Muppets fan, but what do you think it is about the Muppets that has resonated with people for so long now? Nick Stoller: I think that it’s a lot of things. First of all, they’re adorable [laughs]. They’re perpetual underdogs, so you’re always rooting for them. There are so many different personalities so there’s always a new thing to look at. They also, in many ways, originated the comedy style of jokes for kids and sophisticated jokes for adults. And The Simpsons kind of went with that and ran with it. So I think it’s all those things. The other thing too is they’re just a charming group of characters. I think that’s a testament to the genius of Jim Henson.